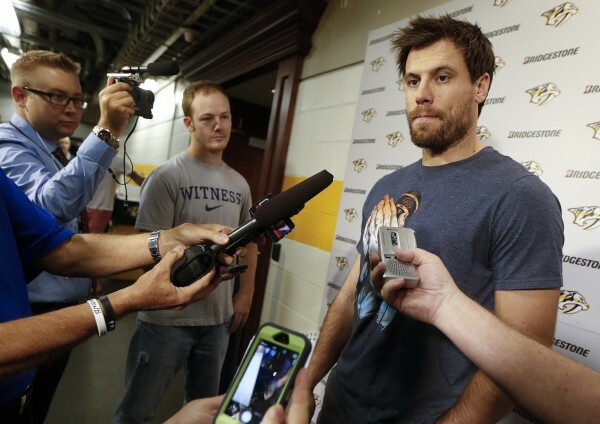 Predators captain Shea Weber answers questions from the media outside the locker room at Bridgestone Arena after the team reported for training camp in September. I am at left wearing the blue shirt. AP Photo / Mark Humphrey. I served as the Nashville Predators beat writer for The Tennessean during the 2014-15 season from training camp in September until the All-Star Break in late January. I worked hard to write accurate, informative and engaging stories with the ever present deadline of a 24/7 news cycle to grow digital readership. I promoted the coverage in social media spaces, produced iPhone videos and enjoyed interacting with fans. Gameday Experience: A chronological sample of my digital coverage during a 14-hour period. Enterprise: Front-page story on the behind the scenes logistics. Breaking/Hard News: The All-Star Game is coming to Nashville. Player Profile: Sports cover story looks closer at Pekka Rinne and new goaltending coach Ben Vanderklok. Mobile video: iPhone produced on deadline.